Recently during a discussion with a few friends, we wondered how our parents from the earlier generation let us loose - seemingly without worrying about us. We were left to wander around the streets, walk to the school by ourselves, no drop and pick ups, go for any extra classes by ourselves, play in the roads without adult supervision and hang out in some playground, street corner without informing them. Were they not paranoid parents like us? Or is it a simple case of parents keeping a watch on us discreetly? Jutta Bauer, a German illustrator and writer of children's books observed kids in great thought going around and arriving safely wherever they have to be. Based on her observation, she conjured up an idea of a guardian angel who keeps these kids safe. This book is a story about grandpa, lying in the hospital, who tells his grand kid about this rather adventurous life. The grandpa was a brave kid who climbed the tallest of trees, dived the deepest of lakes and had a riot of a time with his friends. The words of the picture book follow the words of the grandpa, while illustrations tell a different story. In striking contrast, the pictures tells us that the grandpa climbed the tallest of trees because there was a guardian angel who kept him from falling. Every page we turn, the guardian angel is omnipresent to keep grandpa from falling into deeper trouble. There are multiple layers of story built in the book. The words of the ever happy grandpa, thinking he had a great time during his life and story of illustrations that says he was being helped constantly by an angel. There is another story that unfolds as we read further - a story of hope. It is not as if the grandpa had a great time and lived happily always - He had his fair share of miseries - he was jobless during the war, his friends taken away by Nazis, he struggled to earn a meal for a few years, begged for money, shelter and so on. This thought process that author brings in a subtle manner makes one wonder whether there was a really a guardian angel or is it just the hope and enthusiasm of life that carried the grandpa so long? There are a few other threads that are worth exploring - what happened to the guardian angels for kids taken away by Nazis? Is there a story of faith lying underneath all the action? There are a few other interesting pictures(like a big sculpture of a magnet) thrown at us intentionally or unintentionally to keep us thinking. 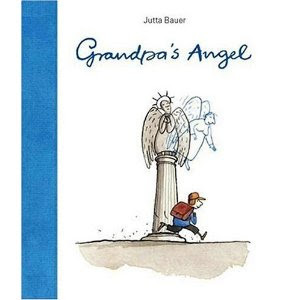 Is Jutta Bauer, the writer telling us the real story or is it Jutta Bauer, the illustrator showing us the real story or is the story something else? The illustrations are simple and cartoon-like with simple, easy strokes and mild colors. The book is around 45 pages, more that the usual 32 pages. It is a fast read and makes one go back to it again and again. All this begs the question - is it a book for kids? I would vociferously say - "Yes". Why not? Why should kids always have books that are cute-sy and the story always laid straightforward? Here is a book that is easily accessible but keeps them thinking. The best kind of book! Reminds me of the story 'Brother Gopal', in which the little boy going through a forest to go to school is told by his mother that he has a brother, Gopal, who lives in the woods, and will come to help him if he ever needs him. True- hope and faith win half the battle for most of us, don't they? Sometimes they are the only things that keep us afloat. A thought to ponder upon. Wonderful pick, Stish. Will look out for this. Sorry about goofing up on the spelling of your name! Sandhya, Thank you. I did not even notice the name goofup! Great story, very delightful. Liked the intro part of the post alot. Thanks for this Sathish. "Is Jutta Bauer, the writer telling us the real story or is it Jutta Bauer, the illustrator showing us the real story or is the story something else?" So glad to find this review! Sheela, A great find indeed - Jutta Bauer does spin a intriguing web in this story. Zoe, Thank you for linking this post.